It’s been well over a year since Coal Age last focused on in-pit crushing and conveying (IPCC) technology. At the time of that report, mining in general was booming and money flowed freely as mine developers pushed hard to complete projects while coal prices were relatively high. Interest in IPCC had been growing and the leading suppliers of IPCC systems had multiple orders on the books. Fast-forward to today: Access to investment funding has been difficult and in some cases, impossible. Many of the boom-time IPCC system orders have been completed, or are in the final stages of installation. Truck and shovel order backlogs have shrunk, and diesel fuel prices, while still relatively high, have not increased disproportionately since crude oil reached a peak of more than $140 a barrel in June 2008, somewhat blunting at least a few of the perceived advantages that an IPCC approach could claim over conventional truck-and-shovel mining. Yet, the basic factors—savings in mining costs, fewer workers in the pit, reduced carbon emissions, to name a few—that make IPCC an attractive option in certain applications are still valid. Technical innovations have emerged for both mobile and semi-mobile IPCC systems, and orders continue to be placed. ThyssenKrupp Robins is the U.S. mining business unit of ThyssenKrupp Fördertechnik (TKF), a large German industrial group which manufactures a wide range of crushing, materials handling and other types of mining and processing equipment. 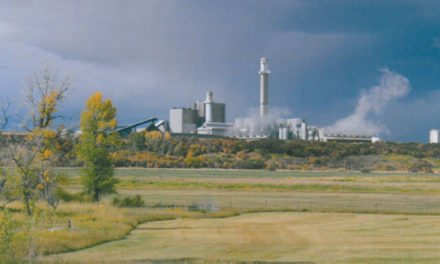 ThyssenKrupp Fördertechnik and Thyssenkrupp Robins (Denver, Colo.) have been involved in IPCC projects in the U.S., Canada, South America, Australia, and Inner Mongolia, in recent years. They expect the number of fully and semi-mobile crushing systems to steadily increase beyond the 200-plus systems that they’ve already supplied. In addition to one of the first modern, fully mobile coal IPCC systems that was supplied to Inner Mongolia in 2007, ThyssenKrupp Fördertechnik has supplied fully mobile IPCC systems for more recent projects. These include three fully mobile IPCC systems with capacities of 6,000 mt/h for overburden and a 3,000-mt/h, fully mobile IPCC system for coal in the Baiyinhua coalfields of Inner Mongolia; four 5,600-m3/h semi-mobile RollSizer crushing plants handling coal and overburden, with spreader systems, installed at the Cöllolar project in Turkey; four 4,250-mt/h semi-mobile crushing plants with gyratory crushers for iron ore in Australia; a 5,000-mt/h semi-mobile crushing plant with a gyratory crusher in Bulgaria; and a 7,000-mt/h waste rock handling system consisting of two fully mobile IPCC systems and a spreader at another location. The Turkish project was particularly interesting, said Armesy. It required a design that would allow the crushing station to be erected within 14 months, provide as low a height as possible, and allow relocation within the shortest possible time and at lowest cost. The system can be fed by five trucks simultaneously. Each station has two feed hoppers and two ThyssenKrupp 950 x 2500 sizers which are directly fed by the trucks. The entire unit is relocated by transport crawler. FLSmidth’s RAHCO business group, based in Spokane, Wash., has developed two new systems for in-pit crushing and conveying, with each taking a different approach: one is designed to work with truck/shovel mining methods; the other is a mobile, conveyor-based system for overburden handling that is similar to previous RAHCO systems designed for this purpose but with additional technological advances. 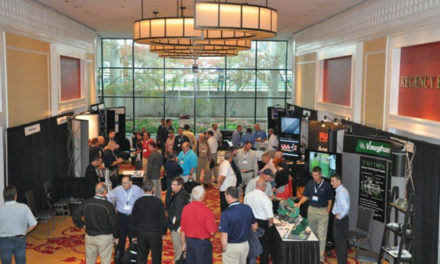 The Dual Truck Mobile Sizer (DTMS) is intended to fill a gap in current IPCC capabilities. To date, available solutions offer either mobile crushing stations where the shovel feeds the crusher’s hopper, or semi-mobile crushing stations where a truck fleet is employed. The DTMS bridges these situations by interfacing with trucks yet remaining fully mobile, allowing for the mining flexibility of a truck haulage operation while retaining the low operational costs of conveyor systems. Integrated material lifting skips eliminate the need for expensive earthen ramps and retaining walls required by conventional semi-mobile, in-pit systems, and reduce truck cycle time. As mining progresses, the DTMS system is relocated (usually in one shift or less) and crushing continues. There are two basic DTMS chassis designs. The first has self-propelled crawler tracks while the second has jacking cylinders at each corner for relocation by a conventional crawler transporter. The latter version is intended for sites where multiple DTMS machines are in service, as only a single transporter is required. 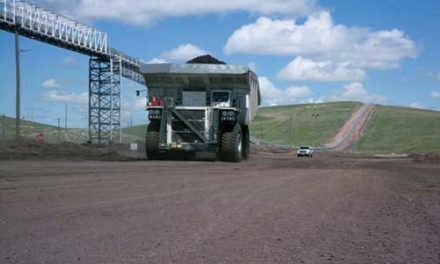 According to the company, because the DTMS isn’t “land-locked” with earthen ramps or retaining walls, it is the only truck dump system that can be linked to a shiftable face conveyor. In addition, DTMS can significantly reduce the number of trucks required to service multiple pits by providing needed flexibility while allowing the mobility and high productivity of a conventional shiftable system. When comparing relocation times as well as costs over current systems, RAHCO says the DTMS has a clear advantage. Movement is measured in hours, not weeks, and with costs being proportional to time, significant savings are at hand. burden handling system, of which the first of two systems to be installed is currently undergoing final commissioning. These Triple Track Mobile Sizer (TTMS) systems comprise two 4,000-t/h, crawler-mounted, triple-track mobile hopper/sizers, and a pair of mobile bridge conveyors that operate in series and feed a 350-m mobile stacking conveyor. Each system has a capacity of 8,000 t/h; total operational capacity is 16,000 t/h. In operation, a shovel feeds a dedicated 4,000-t/h mobile hopper/sizer. For maximum efficiency, each shovel and hopper/sizer combination operates independently of the other. Overburden is reduced to 350 mm, an efficient size for the conveyors. Crushed/resized overburden is then transported along a short telescopic inclined conveyor, transferred at 90˚ to the longer bridge conveyor and transported to another 90˚ intersection where the material is transferred to the second bridge conveyor. At a third 90˚ transfer station, the overburden is switched to the stacking conveyor for computer-controlled dispersal. The entire system is mobile and advances at a speed that accommodates numerous variables such as loading rates, conveying distances and overburden distribution and depth. The only time overburden removal stops is for shovel refueling or regular system maintenance. System alignment is managed by on-board GPS. Control and mechanical improvements allow the TTMS to strip to a depth of 20 m in a single pass, reducing the operational downtime associated with truck-and-shovel operations. The result, according to RAHCO, is an overburden stripping system that is more effective, more efficient and less expensive than traditional methods. The two systems being installed include innovative size reduction equipment within the hopper/sizers and improvements to the loading hoppers’ mobility. Each hopper/sizer uses a single FLSmidth-ABON primary low-speed twin-roll sizer driven through a proprietary quad reduction gearbox generating high levels of output torque capable of reducing the uncontrolled ROM feed to a transportable product size for stacking. The low roll speed protects the sizing elements and drive train from excessive damage or catastrophic failure when tramp metal is encountered in the crushing chamber. To maximize tooth wear life, it also allows for a more positive bite/engagement on larger feed lumps. The sizers incorporate “all-oil-bath” lubrication, which eliminates the need for external auto-lube systems. Each triple track mobile hopper/sizers will carry up to 150 mt of surge capacity and can move even when fully loaded, allowing them to maintain correct position relative to the loading tool. The RAHCO-designed crawler tracks are designed to carry extreme weight and will traverse 20% gradients. Overall mobility and structural integrity is enhanced by the integration of a series of proprietary knuckle joints along the conveyors. Designed to allow for the vertical and horizontal movement of each conveyor, the joints are installed longitudinally on 45-m centers. RAHCO says the system’s overall design will also give site management exceptional control over handling and placing the excavated overburden. It will allow the original topography to be copied, and environmental restoration and rehabilitation can begin almost immediately if desired. Additionally, the resulting extremely flat surfaces of stripped overburden means top soil is less likely to erode, making revegetation more successful. The PF300 is definitely different. The machine can be equipped with a sizer, or a double-roll crusher or a hybrid, for any client’s multiple applications: Sandvik does not rely on only one crushing principle but can select and offer the most effective crusher to the client. The hybrid is a roll crusher that combines the advantages of a sizer and a double roll crusher, thereby closing the gap between these two by introducing high inertia crushing and very good intake behavior. It was designed especially for excellent and higher performance than the common sizer and double roll crushers and also for more critical applications such as abrasive and clogging materials. It is automatically controlled and adjustable from the operator’s control room. Sandvik said it used new technology to provide stability for the PF300, allowing hydraulic excavators or rope shovels to load the crusher without any temporary support. The PF300’s stability is based on having two sets of crawlers. One set is located at the hopper area where impacts are inevitable from shovel bucket dumping, and the second set is located under the crusher. This second set is the steering crawler pair and works according to proven design concepts already used in Sandvik mining equipment such as bucketwheel excavators and spreaders. This design minimizes movement of the upper structure from load impacts in the hopper and makes the machine much more stable compared with most of the known design concepts. This not only keeps availability at a high level, but also improves the positioning of the machine. By shifting the discharge device to a separate system, boom oscillation is uncoupled from hopper loading by the shovel. The PF300 can work in combination with fully mobile belt wagons, transfer conveyors, or load bridges as the connecting downstream link to the face conveyor. The loading bridges are derived from the Sandvik design concept proven on spreaders or bucket wheel excavators and enable the system to work in double or triple block operations, hence reducing shifting sequences of the face conveyors as the mine advances. In the fourth quarter of 2009, Sandvik received an order from a Brazilian customer for a complete crushing and materials-handling system that includes a PF300 mobile unit. The system is scheduled to be commissioned in late 2011.